Is this concept the coolest 3D product on show at CES this year? 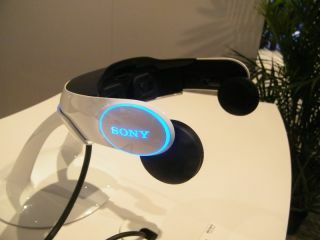 The third and final one of Sony's 3D prototypes at this year's CES is the futuristic-looking 3D headset concept. The headset packs two 3D OLED displays, both with a high-definition resolution of 1280x720, and it's super impressive. Indeed, it's one of our favourite products from this year's CES show – maybe second only to the Blackberry Playbook. It's not a commercial product yet – it's just a tech demo. But there's no denying that it's one of the most awesome implementations of 3D we've seen so far. The headset itself is quite heavy, but the 3D effect is brilliant, and the picture is crisp. We watched various video clips as well as 3D footage from Gran Turismo 5 and it was all spectacular. There was a fantastic sense of depth to the images, and the fact that each eye had its own individual HD display so close-up meant there was a perceived sharpness that was missing from Sony's lenticular OLED TV and BD player prototypes. Frankly, if you gave us the choice between staring at a big 3D TV with active shutter glasses and donning one of these badboys, we'd choose the headset every time. The perceived screen size seemed the equivalent of watching an 80-inch display from around 15 feet away, so there was certainly a very cinematic feel to the experience. We hope Sony launches this headset as a commercial product asap because we want one. Scrap that, make it two - one for me and one for you.